It happens to the best of us. Lost keys. Traffic jam. Coffee travel mug malfunction. One way or another, the day’s showing schedule crashes into a goat rodeo matinee. Until now. Thanks to our new one-click fix: Running Late. Just tell ShowMojo how late you’ll be (example: 15 minutes) and for how long (example: the next 3 hours). 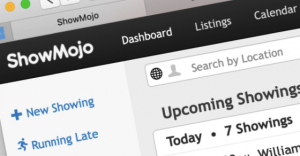 Then ShowMojo will text and email your upcoming showings to let them know. And all the showtimes are adjusted automatically. On multi-user accounts, Running Late is available for each individual showing agent, and adjusts only each agent’s in-person showings. You can even customize the outbound messaging to the prospect. ShowMojo’s new Running Late feature is accessible from both the desktop and mobile dashboards. And, if you must KnowMojo, here’s the article with all the details: Running Late Feature Overview.